The Fellowship was fortunate enough to obtain a copy of HADRIAN’S WALL #1 from Image Comics. Kyle Higgins and Alec Siegel write, Rod Reis draws and colors, and Troy Peteri letters. Simon is a freelance investigator, and the Company has called him in to check out the death of a man on the Hadrian’s Wall, a Company deep-space exploratory vessel. Oh, and the body is that of the man who nearly killed him, stealing his wife and ending his career. The Company isn’t concerned with details on this job, and the ex-wife doesn’t want him around either. Will Simon get any answers? Simon’s motivation for taking this job might have been less than noble, but he seems like the type of “cop” who won’t be able to leave the job half done. This story has some really nice noir elements, and the not-so-near-future setting adds some spice as well. The art shows us a very clean façade too, but there’s just enough behind that surface to help add to the noir feel of the book. There’s an awful lot of hostility on this ship, and it’s a long way from home. There’s quite a murder mystery wrapped up in this sci-fi story package. You’ll want to check this one out. 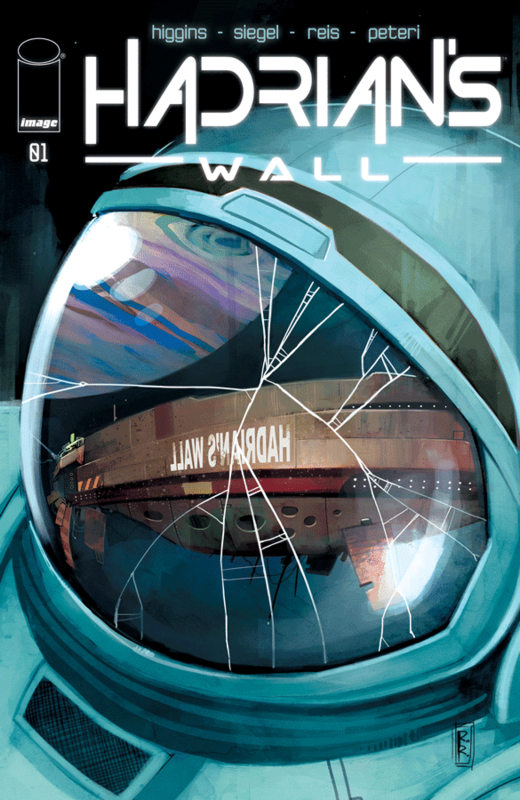 HADRIAN’S WALL #1 is available now at your FLCS or at imagecomics.com.